Chikesia Clemons was assaulted in April by cops. 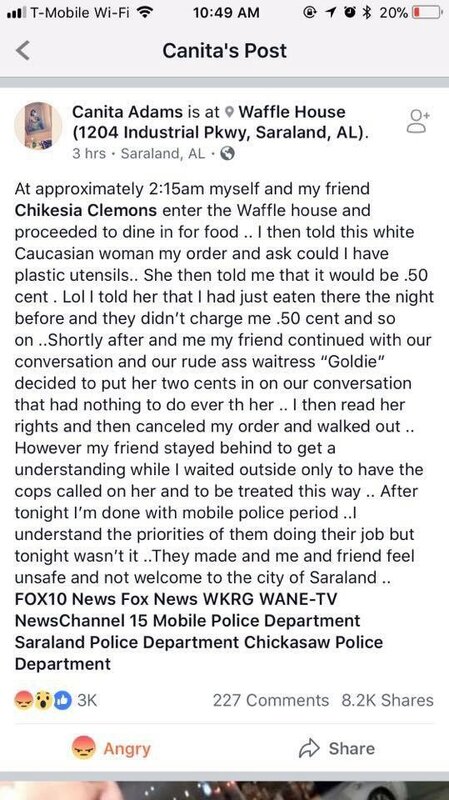 As we all know, from Starbucks to Applebee’s to IHOP, getting respectful customer service can be nearly impossible when you are Black. However, what is even worse is when the injustice is caught on video and you are the one charged with a crime, which is the the case for 25-year-old Chikesia Clemons. Clemons was booked on charges of disorderly conduct and resisting arrest before being found guilty on Monday night. “Judge Mark Erwin said that Clemons was found guilty because the facts of the case met the legal definitions required to find a person guilty, and had nothing to do with the high level of emotion that had played out in the weeks and months before,” AL.com reported. “The judge has ordered a $200 fine plus court costs on the resisting arrest charge along with a $200 fine for the disorderly conduct charge,” WKRG.com reported. Her lawyer said they will file an appeal. How despicable that Clemons was charged with a crime while an officer who violated her civil rights gets no punishment. This is America.